Electric rental scooters are appearing on many East Valley streets, but have yet to make any major appearance in Ahwatukee. Phoenix is following Chandler in taking a wait-and-see approach to the two-wheeled vehicles. Electric rental scooters have quickly become a ubiquitous – and for many, irritating – part of life in the East Valley, popping up near Metro light rail stations, busy street corners and even on a vice mayor’s front lawn. Now, officials in at least three East Valley municipalities are moving to regulate them as they face complaints about blocked sidewalks and restricted access for the disabled as well as fears of serious collisions. But Phoenix is following Chandler in taking a wait-and-see approach to the two-wheeled vehicles. 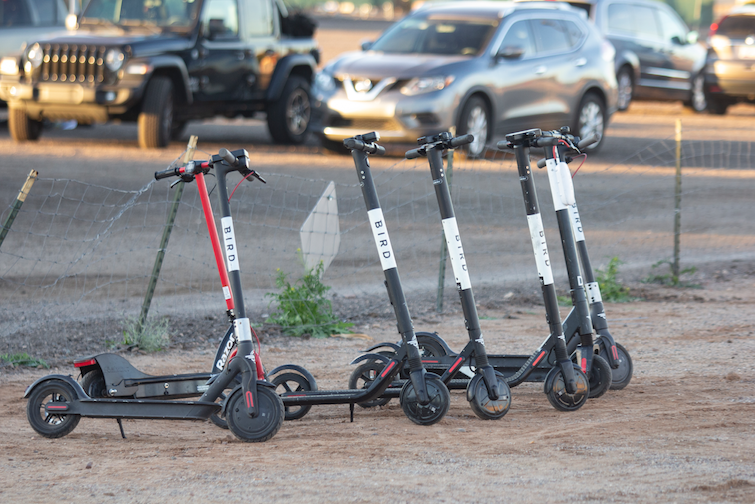 Sam Stone, chief of staff for city Councilman Sal DiCiccio, said the scooters have not yet become an issue in Phoenix, although council at some point is likely to take a comprehensive approach to regulating rental scooters and bicycles. Tempe, which is inundated with hundreds of scooters along Mill Avenue, is on the verge of approving a new series of regulations next month. Mesa City Council is scheduled to review a potential ordinance early next year. The Town Council in Gilbert – where Vice Mayor Brigette Peterson recently found two abandoned scooters on her front lawn – has begun discussing regulations. And Arizona State University has already banned them from its Tempe campus. Scottsdale adopted new regulations governing both rental bikes and scooters in the face of complaints by business owners who kept finding them abandoned in front of their shops and galleries. While Tempe officials want to control the scooters, they don’t want to eliminate them – viewing them as helpful in reducing the number of cars, especially on crowded Mill Avenue, and curbing emissions. But the vehicles got a less favorable reception at a Mesa council study session earlier this month, as Councilman Mark Freeman asked City Manager Chris Brady to report on how scooters are a benefit to the city and whether it would be possible to ban them. Mesa officials appear to consider the scooters more of a nuisance, posing a potential threat to public safety and access for the disabled guaranteed by federal and state law. Mesa Transportation Director R.J Zeder said the city’s streets were not designed to accommodate scooters. Freeman, a retired paramedic with the Mesa Fire Department, worries about inexperienced riders getting hit by cars and suffering serious injuries. Joshua Miller, a general manager for Lime in the Phoenix area, said his company started with rental bicycles, but the market in the East Valley has evolved toward scooters. He said one major difference is that the scooters require little or no exertion because they are motorized. The scooter-mania can be traced to the launch last year to the launch of Bird Rides Inc. in Santa Monica, Calif., Bloomberg News reported earlier this month. Bloomberg said investors pumped hundreds of millions of dollars into Bird and Lime, helping a new industry gain a foothold. Bird describes 100 cities on its website, stretching from Los Angeles to Vienna, Austria, including Tempe and Mesa, as partners in combating carbon emissions and traffic congestion. The website includes endorsements from city officials in Cleveland and New York City. Taylor Strand, who represents Razor Scooters, said she “unequivocally supports” the regulatory framework cities are putting in place. The ordinance requires that devices are operable and used, and prohibits owners from leaving any bike, electric bike or scooter in the same place on public property for 72 hours. Devices must also be picked up within two hours of owners being notified they are inoperable. In Scottsdale, violations could result in impound and a fine between $50 and $1,000 depending on the number of violations. Tempe started planning an ordinance to address the bicycles a year ago, after they first surfaced in December 2017, according to city documents. But the focus had to shift when the scooters started replacing the bicycles in May, said Yee. Companies also would be required to put together an “education and parking plan” aimed at encouraging safety and discouraging dumping them. The Tempe ordinance requires that 20 percent of scooters must be staged south of Broadway Road. 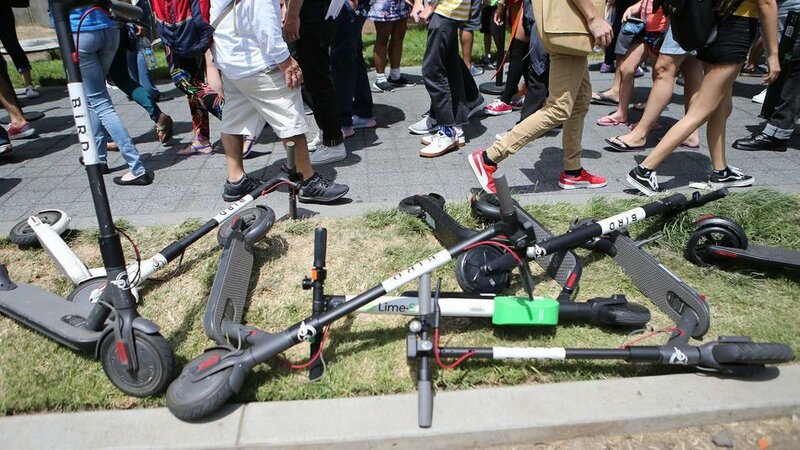 The companies also will be given two hours’ notice to move scooters left in inappropriate locations and will be charged $100 every time a city employee has to move one.